There are many marketing opportunities for urban farmers. Growing food in highly visible and populated areas can attract customers and allow farmers to sell directly to consumers. There are challenges as well, such as competing with farmers from rural areas who have more land, can produce at a lower cost and have more product to sell. 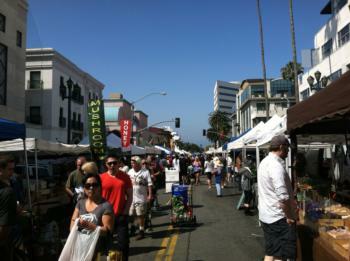 Certified farmers’ markets are often a point of entry for beginning urban farmers. Community Supported Agriculture (CSA) is another common strategy. Both farmers’ markets and CSAs are forms of direct marketing, or selling straight from the farmer to the consumer. Organic certification is another consideration, since some consumers may be willing to pay more for organic produce. Some urban farmers may want to consider agritourism as an option for marketing their farm. The following resources offer more details about direct marketing and other strategies. One resource for deciding how to price farm products is the USDA Market News website, which can be used to run custom reports for specific fruits and vegetables prices, both conventional and organic, at terminal markets in selected cities as well as offering current prices at retail stores.